Prachya Pinkaew is largely responsible for some of the best martial arts movies in recent memory. Films like “Ong Bak”, “Tom Yum Goong” (aka “The Protector”), and “Chocolate” are full to overflowing with flying knees, spinning elbows, and basically crazy Muay Thai freaks doing insane stunts, and that’s what makes them great. His latest movie, “Elephant White”, is his first English-language feature, and has just been released direct to video. While there are some admirable qualities (any movie that begins with an exploding motorcycle gang can’t be all bad), “Elephant White” is an underwhelming experience. Pinkaew sticks to his standard criminal underworld fare, but this film makes abundantly clear that it was his collaboration with actors like Tony Jaa, who is essentially a gnarly little stunt dude, that really made his movies stand out. This time around Pinkaew works with more veteran actors, who happen to be much less accomplished fighters, and the movie suffers for it. In a movie like this you can forgive a lot in other aspects if the action is good enough (no one is going to accuse “Ong Bak” of having the greatest story ever told). However, in the case of “Elephant White”, while the action isn’t bad, it pales in comparison to Pinkaew’s other movies. Curtie Church (Djimon Hounsou) is a CIA trained assassin, now freelancing for anyone willing to fork over his sizeable fee. He is hired by a grieving father to exterminate a gang of human traffickers that kidnapped his daughter, got her addicted to heroin, turned her out, and ultimately killed her. Church is a lone wolf operating in the shadows, and his only ally, in the loosest possible interpretation of the word, is Jimmy, aka English (Kevin Bacon with a silly accent that I would swear is South African, not British), a Versace wearing arms dealer who doesn’t actually carry a gun himself. He says things like, “Happiness is a warm gun”, and talks about opening his own version of Planet Hollywood, only with famous movie weapons. While Church tries to instigate a war between his targets and a rival gang, Mae (Jirantanin Pitakporntrakul), a Buddhist-proverb-spouting junior-prostitute, follows him around, and for some reason, he doesn’t chase her off. Then things get messy as all hell. There are betrayals, seeming betrayals that aren’t really betrayals, and faltering attempts at plot twists that come one after another after another. Hounsou is a solid badass, it’s a role that fits him particularly well, and while there is some nice, better than average action, the script doesn’t give him a lot to work with. 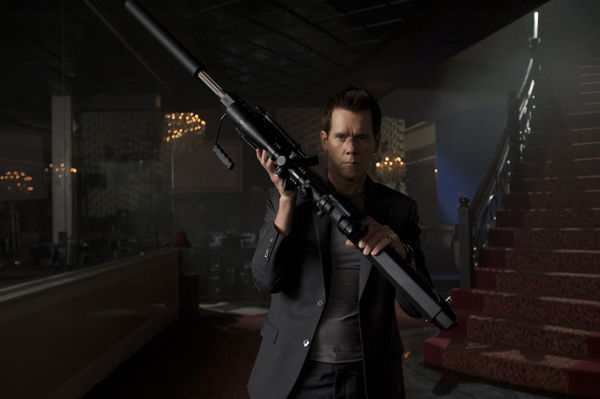 Too many scenes take place with Curtie at the end of a sniper rifle, looking through a long-range scope as he picks off his intended targets. You can get away with this once, but Pinkaew uses this tactic over and over again. There’s no tension in a scene like that, and they feel like watching someone play a first-person-shooter videogame, and it gives “Elephant White” a repetitive vibe. There is certainly enough action to keep you interested, and carry you past some of the problems with the plot, but not all of them. The worst offense is that things happen without even the slightest motivation. Mae shows up, Curtie lets her hang around, and somehow, without any reason at all, he trusts her implicitly all of a sudden, even when it appears she sells him out to the badguys. He’s even willing to risk his life for her, despite the fact that it is already established that he’s a in no way emotionally involved in his work, and that there is no bond or connection between them. Try to dig too deep in this one and you’ll give yourself a headache. “Elephant White” isn’t horrible, it just isn’t anything special. It’s a middle of the road DTV action flick that could have been significantly better. Not to harp on a single point, but if a few more of the action scenes had been of the more up close and personal variety, this would have been pretty awesome. And that’s even with the inclusion of my LEAST FAVORITE PLOT TWIST EVER. I won’t go into any specifics so as not to ruin it for you, but I suspect that you, too, will see it coming from the first act. For a twist it’s not very twisty. Still, “Elephant White” is worth a look if you’re into DTV action, and tolerant of it’s shortcomings, but don’t look to the Blu-ray/DVD to add, well, anything to the mix, unless you’re really into previews from Millennium Films.